Many of Canada’s para-swimmers hoped that the national swim trials in Toronto last week would increase visibility for athletes with disabilities. Swimmers from across the country competed to qualify for summer championships. It was the main qualifying event for many athletes and para-swimmers. “The more people see paralympic sport, see our athletes compete, see them train, understand what they have to go through to get to the world stage, and be competitive and get on the podium, they understand after the fact,” said Martin Richard, executive director of communications of the Canadian Paralympic Committee. Richard says events like this are important because Canadians aren’t quite at the point where they value Paralympic Games medals to same extent as Olympic ones. And no one knows more about the inequity than paralympians themselves. Elisabeth Walker-Young is a three–time Olympic gold medalist. The paralympic swimmer from Toronto says more needs to be done to advocate for athletes with disabilities. 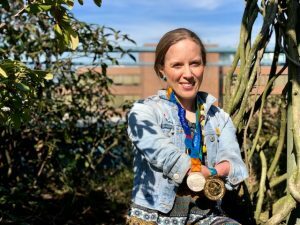 She came up through the system at a time when people didn’t even seem to know that there was such a thing as an Olympic competition for disabled athletes. Paralympic swimmer Elisabeth Walker-Young holds a gold medal from Sydney 2000 and a bronze medal from Athens 2004. When she realized how much work was left to be done, she abandoned her original plan to become an occupational therapist in order to advocate full-time. Walker-Young started swimming at the age of two and qualified for her first Paralympics in 1992. She has won three gold, one silver, and two bronze medals for Team Canada. In 2015, she was chosen as Canada’s chef de mission for the Toronto Parapan American Games, a prestigious position as the official leader and spokesperson for the team. Before her appointment as chef de mission, the role was held by people who were high up in their professional careers. “And I was like ‘I need to change this — athletes need to be in this role,’” she said. Walker-Young believes she was her most powerful in the pool. But even as someone who represented her country at the highest competitive level, she still faces discrimination. Walker-Young vividly remembers an experience when she was in the change room after swimming and people applauded her for getting dressed on her own. “I am who I am and I’ve had the experiences that I’ve had because I have a disability, but until society sees me as their peer and their neighbour and their colleague and a contributing member of society, without blowing up the disability, I can’t go there yet,” she said. Walker-Young says that when it comes to including people with disabilities, competitive sport has changed a lot, but more needs to be done. “The first time I made the Paralympics, athletes were actually asked to contribute financially to go. I don’t think any Olympic athlete in the history of Team Canada on the Olympic side has ever had to pay their own way,” she said. Financial support is a key issue for athletes. In fact, after the 2014 Olympics in Sochi, medal-winning athletes were given thousands of dollars for their medal placements, while Paralympians didn’t receive anything. Martin Richard says that things are improving on that front too. “Today we have funding in place, a support system for athletes, access to resources, sports science, the best coaches in the world for our paralympic athletes. So the movement has gone from what you could have called amateur back then to a very professionalized, structured system today,” he said. He also said that positive changes are occurring in the world of para-swimming. Despite impressive achievements para-swimmers do not receive the same treatment and recognition as able-bodied athletes. “There is not much difference between us and able-bodied [swimmers], except we just swim a bit slower and we have different modifications. There’s no huge difference, we are all going to the same level. Our times are just different,” said Krystal Shaw. Krystal Shaw, a Paralympic Games hopeful, trains out of the Flatland Swim Club in Regina, Sask. Shaw competed in the 2009 Para-Swimming World Championships, swimming freestyle, backstroke, and breaststroke. Now, as a 25-year-old, she is working toward her goal of qualifying for the Tokyo 2020 Paralympic Games. Every little bit of encouragement helps, and she says that listening to Walker-Young at a Para Prospects West Swim Camp was inspiring. “The way she was talking about all the struggles that she went through and not only talking about just her achievements — as an athlete you go through both struggles and achievements — so having someone who’s been through that [is meaningful],” said Shaw.